Wine writers sometimes compare wines to pieces of music, a particular musical style or artist, or even to specific musical parameters. To date, though, it is unclear whether such comparisons merely reflect the idiosyncratic matches of the writers concerned or whether instead they reflect more general crossmodal matching tendencies that would also be shared by others (e.g., social drinkers). In our first experiment, we looked for any consensual patterns of crossmodal matching across a group of 24 participants who were presented with four distinctive wines to taste. In our second experiment, three of the wines were presented with and without music and 26 participants were asked to rate the perceived sweetness, acidity, alcohol level, fruitiness, tannin level, and their own enjoyment of the wines. Taken together, the results of the two experiments reported here suggest that people (social drinkers) share a number of crossmodal associations when it comes to pairing wines and music. Furthermore, listening to the appropriate classical music can enhance the overall experience associated with drinking wine. As such, our findings provide prima facie evidence to support the claim that comparing a wine to a particular style of music (as documented in the work of a number of wine writers) might provide the social drinker with useful clues about the sensory properties that they should expect to perceive in a wine should they eventually get to taste it. ‘I have tasted first-attempt Chardonnays that were like Dizzy Gillespie’s solos: all over the place. And the color of his trumpet, too. On the other hand a Stony Hill Chardonnay recently had the subtle harmonies and lilting vitality of Bix Beiderbecke. Robert Mondavi’s Reserve Cabernets are Duke Ellington numbers: massed talent in full cry. Benny Goodman is a Riesling from Joseph Phelps, Louis Martini’s wines have the charm and good manners of Glenn Miller. Joe Heitz, though, is surely Armstrong at the Sunset Café; virtuoso, perverse and glorious.’ (, p. 253). ‘Taking a sip of wine, at least a wine worth talking about, is like hearing the sound of a sustained, musical chord.’ (, p. 27). ‘…it’s hard to think of music that is more transparently effervescent than Steve Reich’s Octet and Music for Large Ensemble. Both have textural aspects strongly reminiscent of Champagne. Bouncing along optimistically, motives advance and recede like the frothy mousse of a freshly poured glass: bubbles forming and popping with little explosive jolts, instantly replaced by others. I’ve listened to these pieces hundreds of times, and full of perpetual motion, they sparkle along and never sound quite the same.’ (, pp. 122–123). Going one step further, some writers have suggested an even closer connection between wine and musica. ‘Red wines need either minor key or they need music that has negative emotion. They don’t like happy music…Cabernets like angry music.’ (, cited in ). The tendency to draw comparisons with experiences from another sensory modality in order to express something that may be difficult to capture in the original sensory domain is a well-attested fact (see , for a review). But in the case of wine and music, one can ask whether crossmodal associations reflect anything more than merely the idiosyncratic matches of individual writers? Do they also mean something to the social drinker? If the latter interpretation is correct, the suggestion that emerges is that these metaphors or analogies could perhaps convey some useful information about the sensory qualities of the wines so described.b The hope here is that there are certain sensory attributes of a wine that really do share a perceptual affinity with particular musical parameters, and that this might be what the wine writers are picking up on intuitively. However, to date, there has been no empirical test of the claim that such musical associations are shared between individuals within a society. The primary aim of the present study was therefore to determine whether there would be any agreement in a sample of social drinkers concerning which of a pre-selected range of classical music pieces they would select as best matching a selection of four different wines that had been chosen to display a range of distinctive sensory characteristics.c d In addition, we also investigated whether listening to the appropriate (that is, matching) classical music would affect the experience of drinking wine. A large part of what people typically describe as the taste or flavor of a wine actually comes from the nose. In fact, some say as much as 80% of flavor is derived from the sense of smell (for example, Dr. Susan Schiffman quoted in the Chicago Tribune, 3 May 1990; ). 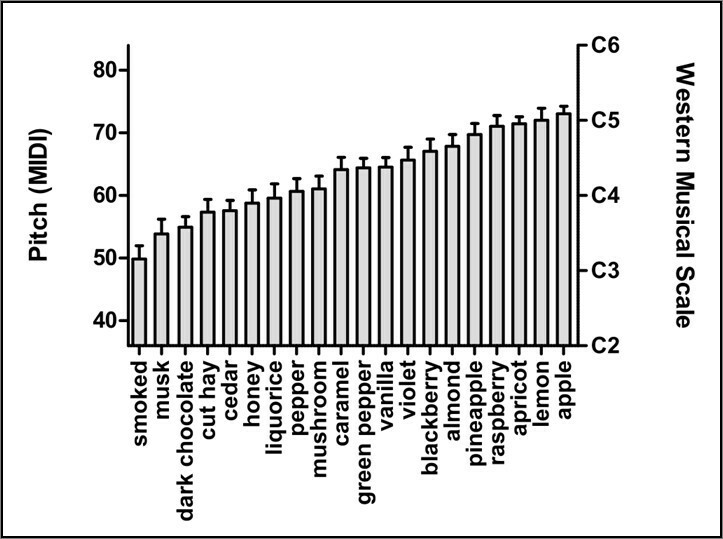 Hence, the first thing to check here is whether there is a general crossmodal matching of musical parameters with specific attributes of wines based on their aroma (detected either orthonasally or retronasally; see ).e In this regard, it is interesting to note that we often describe certain aromas/fragrances in terms of high notes (for example, lychee), while describing others as low notes instead (see  for a review). Interestingly, while the use of the same terms - high and low notes - to describe both tones and aromas is widespread and long-standing (compare with , for an early example), we still do not have any clear understanding of the underlying reason for this (see  on this point). Crisinel and Spence  have conducted a study that was designed to investigate whether participants would reliably match certain of the aromas that are commonly found in wines with particular classes of instrument and/or musical notes (see also , for early research in this area). The participants in Crisinel and Spence’s study were presented with a selection of aromas from the Nez du Vin kit (Brizard & Co, Dorchester, UK); 20 out of the 54 samples from the kit were selected, comprising: almond, apple, apricot, blackberry, caramel, cedar, dark chocolate, cut hay, green pepper, honey, lemon, liquorice, mushroom, musk, pepper, pineapple, raspberry, smoked, vanilla, and violet. The participants had to sniff each aroma orthonasally (from a small bottle) and then match it with one of 13 sustained notes (each note was presented for 1,500 ms), from C2 (64.4 Hz) to C6 (1,046.5 Hz) in intervals of two tones, on a virtual keyboard presented on a computer. By interacting with the digital interface, the participants were able to listen to each note being played by one of four different classes of musical instrument (piano, brass, strings, or wind). Thus, the participants had 52 different sounds (13 notes × 4 instruments) to choose from when selecting a sound to match each of the odors they were presented with. Choice of instrument as a function of the odor presented in Crisinel and Spence’s  recent study in which the participants matched each of 20 typical wine aromas to a specific class of musical instrument. 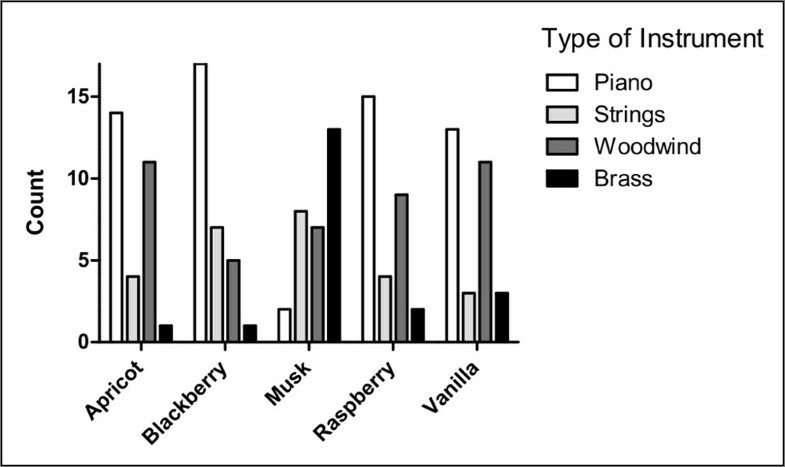 Only those odors that led to significant preference for a particular class of musical instrument are shown. Note that the total count per category is 30. (Figure reprinted with permission from ). Mean pitch matched to each odor in Crisinel and Spence’s  study. MIDI (musical instrument digital interface) note numbers were used to code the pitch of the chosen notes. Western musical scale notation is shown on the right-hand y-axis. High-pitched notes were preferred for fruits. (Figure reprinted with permission from ). Over the last few years, a number of other researchers have also investigated the tendency of people to crossmodally match basic tastes (for example, sweet, sour, bitter, and salty) with specific musical parameters (for example, [14–16]; see also ). The results of this research have tended to converge on the conclusion that people match sour-tasting foodstuffs with sounds that have a higher pitch while matching bitter-tasting foods and beverages with sounds having a lower pitch (see , for a review). The story, as regards sweet tastes, is somewhat more complex, for while people often match them with sounds having a high pitch (for example, ) in other studies they have been shown to associate them with lower- pitched sounds (see ). In terms of the more complex parameters of music and their association with basic tastes, the available research suggests that ‘sour’ musical improvisations ought to be high-pitched and dissonant; ‘sweet’ improvisations are consonant, slow and soft; ‘bitter’ improvisations are low-pitched and legato; ‘salty’ improvisations are staccato and dense in wide musical intervals (that is, successive notes of very different pitches). The research that has been published to date clearly demonstrates that certain styles of musical improvisation can reliably connote basic tastes, and possibly also flavors (see ). Here, we present two experiments: In the first, we built on Crisinel and Spence’s  research documenting the existence of a variety of crossmodal correspondences between specific notes and instrument types and individual aromas, as well as extending the growing body of research showing a crossmodal match between musical parameters and basic tastes and flavors (for example, [18–20]) in order to determine whether any crossmodal correspondences could be documented at the level of more complex pieces of classical music and a selection of quality wines.g Should such crossmodal correspondences be obtained in a group of social drinkers then these results would at the very least provide some prima facie evidence that when wine writers associate particular wines and specific pieces, or styles, of music then they might be picking up on the crossmodal correspondences that are common to us all (). Note that when assessing the responses of participants in this study, there are no objectively correct answers in terms of which piece of music matches with a specific wine. Instead, what we are looking for is some ‘consensuality’ or uniformity in terms of the choices that people make. Any such consensuality would be expected to show up in terms of patterns of matching that deviate from what one might expect by chance. In our second experiment, we move on to assess any influence that the musical pieces may have in the perception of a variety of wine attributes; namely sweetness, acidity, alcohol level, fruitiness, tannin level, and the taster’s enjoyment of the experience when compared to the ratings of the same wine made in silence. Ethics approval: the experiment was reviewed and approved by the Central University Research Ethics Committee of the University of Oxford, and complied with the Helsinki Declaration. Participants: 24 participants (15 females, 8 males, and 1 who failed to specify their gender); age (mean ± SD) 34.7 ± 14.5 years, range 24 to 42 years) verbally agreed to participate in the study after the experimental procedure had been explained. Venue: the study was conducted at the premises of The Antique Wine Company (AWC) Wine Academy in central London. All of the participants were seated in a professional wine tasting room. Each participant was seated at a table and had four pre-poured numbered glasses of wine laid out in front of them. Around 2 cm of each wine was poured into standard tasting glasses. No refills were provided and hence the participants were repeatedly told to conserve their samples for the duration of the experimental test (which lasted for about 45 minutes, and which informal observation revealed that participants were able to do). When the participants arrived at the AWC premises they were held in the reception until everyone had arrived. They were then led into the tasting room as a group. Demonstrating balanced acidity: wine: Domaine Didier Dagueneau, Pouilly Fumé Silex 2010. Grape: Sauvignon Blanc. Tasting notes: very fine, pure and sophisticated. Clean with razor sharp acidity which is balanced by fresh blackcurrant leaf flavors. Demonstrating purity of fruit: wine: Domaine Ponsot, Clos de la Roche 2009. Grape: Pinot Noir. Tasting notes: luscious and fruit packed with heaps of fresh cherry, spice, earth and game on the nose. Well-structured with layers of rich, naturally sweet red fruits and mouth coating flavors that explode on the formidably long finish. This is a classy wine with absolutely superb complexity, impeccable balance and almost uncanny presence, all delivered with grace and power. Demonstrating supple tannins: wine: Château Margaux 2004. Grape: Cabernet Sauvignon. Tasting notes: a classic Bordeaux vintage. There is great finesse and above all purity on the nose; in this subtle combination of floral, fruit and spice aromas, all are clearly present but no single aroma dominates. On the palate, the tannic structure is tight-knit, fine, and tender. The general impression is of balance, precision, freshness, and grace. Demonstrating pleasurable sweetness: wine: Château Climens Sauternes 2001. Grape: Semillon. Tasting notes: attractive nose with hazelnuts, vanilla and apricot. Lots of dried orange peel and honey in this excellent sweet wine. Dense and very sweet on the palate with bright acidity and wonderful purity of fruit. Soft, well-balanced and very elegant long finish. The London Symphony Orchestra (LSO) selected the following range of pieces of classical music - all involving some combination of wind and string instruments: this constraint in the musical selections was dictated by the fact that this research was conducted as a precursor to a much larger private event in which the plan was that a quartet of wind and string musicians from the LSO would play a selection of musical pieces to accompany the selection of wines tasted in the present study. The final event did indeed take place in LSO St. Luke's, London on 24th October, 2013 in front of an audience of more than 100 people, and with a quartet from the LSO playing the musical selections that had been identified as best-matching by the present research. Mozart, Flute Quartet in D major, K285 - Movement 1, Allegro. This piece of music is melodic, lively, consonant, several themes, a sonata form movement. The flute has concerto-like prominence. Tchaikovsky, String Quartet No 1 in D major - Movement 2, Andante cantabile. This piece of music is poignant and has a melancholic melody based on a folk tune (it moved Tolstoy to tears, apparently). Ravel, String Quartet in F major - Movement 1, Allegro moderato, très doux. This piece has a sonorous, calm first subject followed by a haunting second theme. Debussy, Syrinx. Exotic and meandering. Major and minor intervals create a minor dissonant feel which then moves into a major sound and changes between the two. This piece is for solo flute and woodwind. Ravel, String Quartet in F major - Movement 2, Assez vif. This piece of music is playful, dramatic, and has pizzicato features. Mozart, Flute Quartet in D major, K285 - Movement 2, Adagio. This piece of music is slow, melancholic, with pizzicato strings. Tchaikovsky, String Quartet No 1 in D major - Movement 3, Scherzo, allegro non tanto e non fuoco. This piece of music is bold and lively and in a minor key, but skips to a lively dance-like rhythm. CPE Bach, Solo Sonata in A minor - Movement 2, Allegro. Fast, upbeat, and virtuosic. This is a piece for solo flute, woodwind. Procedure: the participants were presented with the four glasses of wine in a purpose built tasting room. They were first given a five to ten minute introduction to wine tasting, and the various attributes that they should look out for in a wine. The participants were given a small sample of rosé to practice tasting with. The participants then spent ten minutes filling in a one page questionnaire concerning each wine (see Figure 3; these results were not analyzed). This questionnaire was designed to encourage the participants to think about some of the pertinent sensory qualities of each of the wines. The eight pieces of music were then played, from a portable hi-fi from loudspeakers at a comfortable listening level, in the order listed above. Each piece was presented for approximately three minutes. 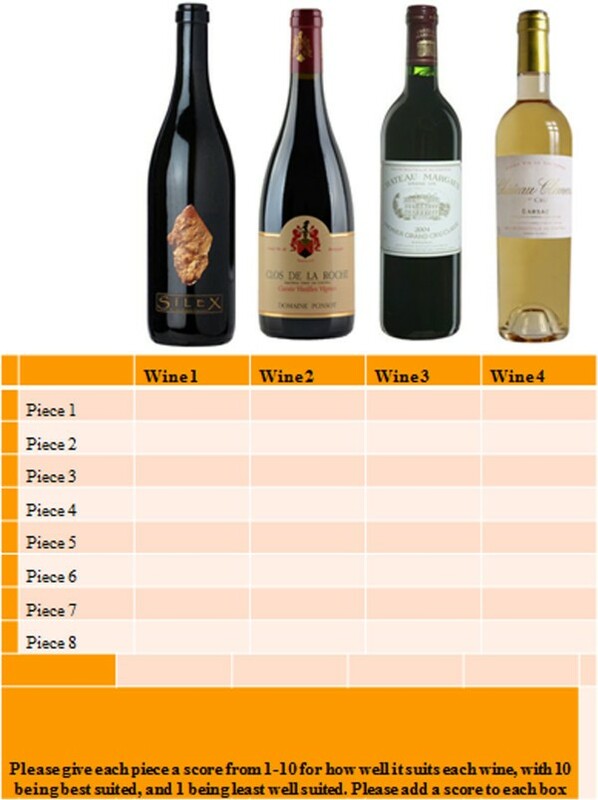 During that time, the participants were instructed to taste each of the wines and assign it a score from 0 to 10 depending on how well they thought the wine matched the music (with 0 = not at all, and 10 = a perfect match) using the form shown in Figure 4. Thus, the maximum score that any combination of wine and music could achieve was 240 (that is, 24 participants all giving the pairing a maximum rating of 10). Questionnaire that participants completed ( one sheet for each wine) at the start of experiment 1. Note that a C2 (64.4 Hz) note was played in order to anchor the participants’ judgment of a low note and a C6 (1,046.5 Hz) note was played in order to anchor their judgment of what was meant by a high note. 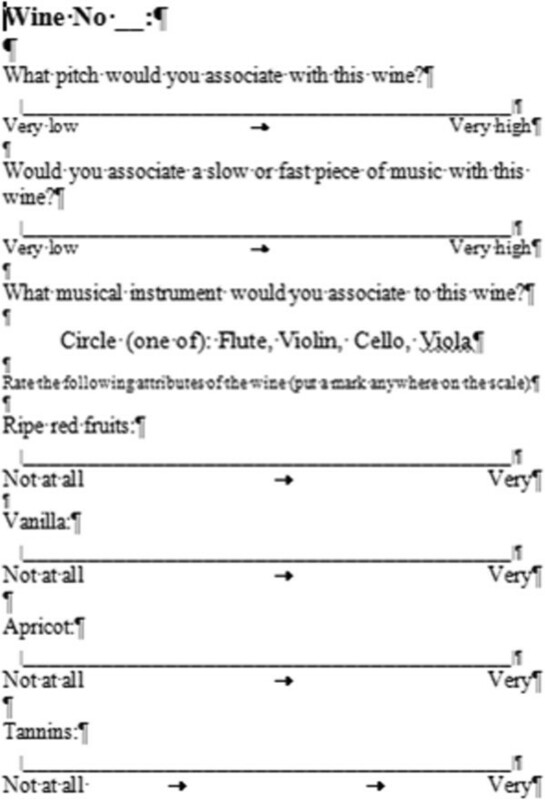 The questionnaire used to assess the degree of match between the four wines and each of the eight pieces of classical music tested in experiment 1. The participants were instructed to give a score between 0 (no match) and 10 (a perfect match) in each cell to indicate how well they felt that the music matched the wine. The participants were were discouraged from comparing notes. They were instructed to remain silent, and were instructed not to go back and change their answers after going to the next played music. After each wine, the participants had a glass of water to cleanse their palate should they so desire. After having rated each wine for its match with each of the eight pieces of music, the experimenter debriefed the participants concerning the purposes of the study, and summarized the results of previous research on the pairing of music and wine (see , for a review). The participants were also encouraged to ask any questions that they might have. The whole session lasted for about 90 minutes. The numerical values given by the 24 participants were analyzed using a repeated measures analysis of variance (ANOVA) with the factors of wine (four levels) and music (eight levels). This analysis (using the Greenhouse Geisser correction) revealed a significant interaction (F(8.401, 193.212) = 11.429, P < .001) between the factors showing that participants’ ratings of the match between the music and wines were non-random (see Figure 5). Summary of results from the classical music wine-tasting matching study (experiment 1). The ratings were obtained by asking the participants to rate from 0 to 10 how well they thought the wine matched the music (with 0 = not at all, and 10 = a perfect match). A closer analysis of the data revealed that participants judged certain of the wines to be a particularly good (or bad) match for specific pieces of the classical music that had been chosen for use in the present study. Separate repeated measures ANOVAs were then performed in order to assess any differences in the matching ratings between musical pieces for each wine and the results of these analyses are presented below. A significant difference between the ratings for the different musical pieces was observed (F(7, 161) = 12.116, P < .001). In particular, pairwise comparisons (with the Bonferroni correction) revealed that participants rated Mozart’s Flute Quartet in D major, K285 - Movement 1, to be a much better match for this white wine, than Tchaikovsky’s String Quartet No 1 in D major - Movement 2 (P < .001), Ravel’s String Quartet in F major - Movement 1 (P = 018), and Tchaikovsky’s String Quartet No 1 in D major - Movement 3 (P = .017). The participants also rated Debussy’s Syrinx (P < .001), Ravel’s String Quartet in F major - Movement 2 (P < .001), Mozart’s Flute Quartet in D major, K285 - Movement 2 (P < .001), and CPE Bach’s Solo Sonata in A minor (P < .001), as offering a better match with this wine than Tchaikovsky’s String Quartet No 1 in D major - Movement 2. CPE Bach’s Solo Sonata in A minor was also rated as more congruent with the Pouilly Fumé than Tchaikovsky’s String Quartet No 1 in D major- Movement 3 (P = .018). Once again, a significant difference between the ratings for the various musical pieces was observed (F(7, 161) = 6.691, P < .001). Pairwise comparisons revealed that the participants rated Ravel’s String Quartet in F major as offering a better musical match for this wine than Mozart’s Flute Quartet in D major, K285 - Movement 1 (P < .001), Debussy’s Syrinx (P < .001), and Mozart’s Flute Quartet in D major, K285 - Movement 2 (P = .002). Additionally, Tchaikovsky’s String Quartet No 1 in D major - Movement 2 was rated as a better match for the Clos de la Roche than was Mozart’s Flute Quartet in D major, K825 - Movement 1 (P = .043). Finally, Tchaikovsky’s String Quartet No 1 in D - Movement 3 was rated as more congruent with this red than was Debussy’s Syrinx (P = .022). A significant difference between the ratings for the various musical pieces was obtained (F(7, 161) = 19.710, P < .001). Pairwise comparisons revealed that participants rated Tchaikovsky’s String Quartet No 1 in D major - Movement 2 as more congruent with red wine, than any of the other musical pieces (P < .05 for all comparisons) except Tchaikovsky’s String Quartet No 1 in D major - Movement 3, which was rated as more congruent with the Château Margaux than any of the remaining musical pieces (P < .05), with the exception of Tchaikovsky’s String Quartet No 1 in D major - Movement 2, and Ravel’s String Quartet in F major. Additionally, Ravel’s String Quartet in F major was rated as more congruent with the Château Margaux, than either Mozart’s Flute Quartet in D major, K285 - Movement 1 (P = .004), or CPE Bach’s Solo Sonata in A minor (P = .044). No significant difference between the ratings on each musical piece was found (Greenhouse Geisser corrected, F(4.127, 94.932) = 12.116, P = .064). One possibility that is worth considering here is that populations normally segment into sweet-likers and sweet-dislikers (see ), and hence there may not have been a uniform response to this wine amongst the population tested (unfortunately, however, we did not collect any hedonic ratings for the wines). Based on the findings of our first experiment, in which evidence was obtained to support the idea that people match certain wines with some pieces of classical music more than with others, we moved on, in experiment 2, to determine whether playing the matching music would actually influence a taster’s/drinker’s rating of the sensory-discriminative and/or hedonic properties of the wine as compared to the ratings obtained when tasting in silence.h Suggestive evidence that such a pattern of results might, in fact, be obtained comes from a number of recently-published studies (for example, [23, 24]; though see also ). So, for example, Prof. Adrian North  has demonstrated that students rate wines (one red, a Chilean Cabernet Sauvignon, and the other a white, Chardonnay) as more powerful and heavy when music that had been rated as ‘powerful and heavy’ (for example, Carmina Burana by Orff) is played in the background; while playing music that has been categorized as ‘zingy and refreshing’ (‘Just Can’t Get Enough’ by Nouvelle Vague) brings out the same qualities in a white wine. Interestingly, however, playing one style of music versus another did not influence the students’ rating of how much they liked the wine in North’s study (see , on this point). In experiment 2, we build on the results of experiment 1 (and previous research suggesting that music can influence food and drink perception), in order to assess whether playing the best-matching music (as rated by the participants in our first experiment) would have any effect on people’s perception of sweetness, acidity, alcohol level, fruitiness, tannin, and their enjoyment of the wines relative to when the wines were tasted without music. These attributes were chosen, in part, because four of them were the attributes that the wines had been selected to emphasize. Twenty six participants (aged 21 to 60 years) verbally agreed to take part in the study after the experimental procedure had been explained to them. The experiment had been approved by the Central University Research Ethics Committee of the University of Oxford. The tasting event lasted for approximately 90 minutes. The wines were the same as those used in experiment 1, while the musical selection included four of the pieces used in experiment 1: Mozart’s Flute Quartet No 1 in D major, K 285 - Movement 1, Allegro; Ravel’s String Quartet in F major - Movement 1, Allegro moderato - très doux; Tchaikovsky’s String Quartet No 1 in D major - Movement 2, Andante cantabile; and Debussy’s Syrinx. Participants were invited to take part in a tutored wine tasting with musical accompaniment. On arrival, the participants were given a glass of Champagne. When they had all arrived, they were escorted as a group into the purpose-built tasting room. The procedure was just as for experiment 1 with the following exceptions. The participants tasted each of the four wines twice. For the first three wines, the second tasting of the wine (which took place about five minutes after the first) was accompanied by the playing of a pre-recorded piece of music at a comfortable listening level. By contrast, the two ratings of the fourth wine were made without any musical accompaniment. The music that, according to the results of experiment 1, best matched the wine was played over the hi-fi via loudspeakers after the participants had made their second rating. The distinctive features of the wines were described to the participants as the experiment proceeded. In order to determine whether the participants in the present study rated any of the attributes of the wines differently when listening to the music as compared to when tasting in silence, independent paired-samples t-tests were performed on the ratings made by participants with and without music (that is, for wines 1 to 3). In addition, repeated measures ANOVAs were performed in order to assess any overall effect of the presence of music, the wine, or the interaction between the two, on the ratings for each attribute, and for each wine. The results of experiment 2 are shown in Table 1. They highlight a trend toward the participants rating the Domaine Didier Dagueneau as less acidic in the presence of music and as having higher alcohol content. Crucially, this wine was rated as being significantly more enjoyable when tasted together with the pre-selected matching music than when tasted in silence. The bolded P values either reached significance (P < .05), or else were near significant, suggesting the existence of a trend (see acidity in Domaine Didier Dagueneau - two-tailed- and enjoyment, sweetness, and alcohol in Domaine Ponsot, Clos de la Roche 2009 - one-tailed). Here, t stands for the t value, df for degrees of freedom, and sig. for significance. By contrast, there were no significant differences between the ratings with and without music, when it came to the Domaine Ponsot, Clos de la Roche 2009. Interestingly, the participants also rated the Château Margaux 2004 as significantly more enjoyable when tasted while listening to the matching music. Figure 6 present the difference between the ratings with and without music. Mean difference between the first and second ratings of the three wines that were evaluated first without music, followed by an evaluation in the presence of the putatively matching music in experiment 2. The significant results (P < .05) obtained through the paired-samples t-tests are indicated with a *. Based on the results shown in Table 1, further analyses of the data were conducted. In particular, a two-way repeated measures ANOVA was performed with the factors of wine (three levels) and music (absent versus present) for each of the attributes that were rated by participants for the first three wines (that is, those that were rated the second time around while listening to music). There was a significant main effect of music (F(1, 23) = 4.466, P = .046). Pairwise comparisons (using the Bonferroni correction) revealed that sweetness ratings were higher overall when tasting while the participants listened to the music (P = .046, without music M = 2.64, with music M = 2.93). There was a significant main effect of the wine (F(2, 48) = 6.869, P = .002), and a trend toward a main effect of music was also documented (F(1, 24) = 3.417, P = .077). 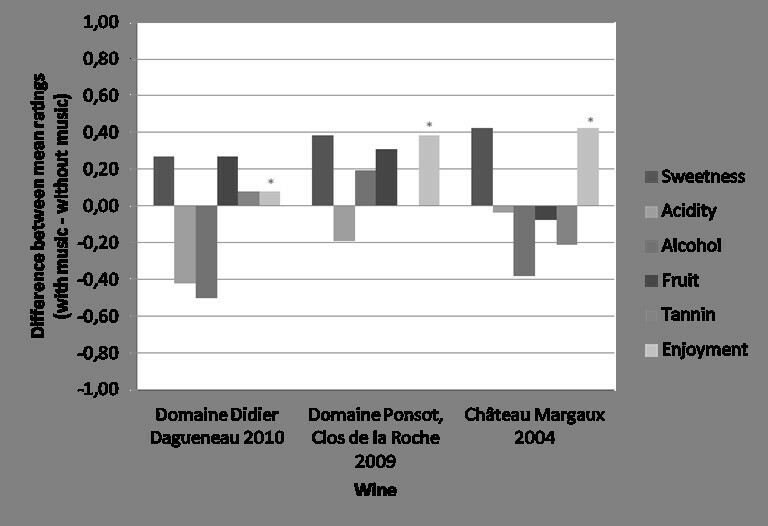 Pairwise comparisons revealed that the Domaine Didier Dagueneau 2010 received higher sourness ratings as compared to the Château Margaux 2004 (P = .002). The participants also rated the wine as tasting somewhat more acidic while listening to the music that had been selected as matching in the preceding experiment (though this difference just failed to reach significance; p = .077). There was a significant main effect of the wine (F(2, 48) = 3.478, P = .039). 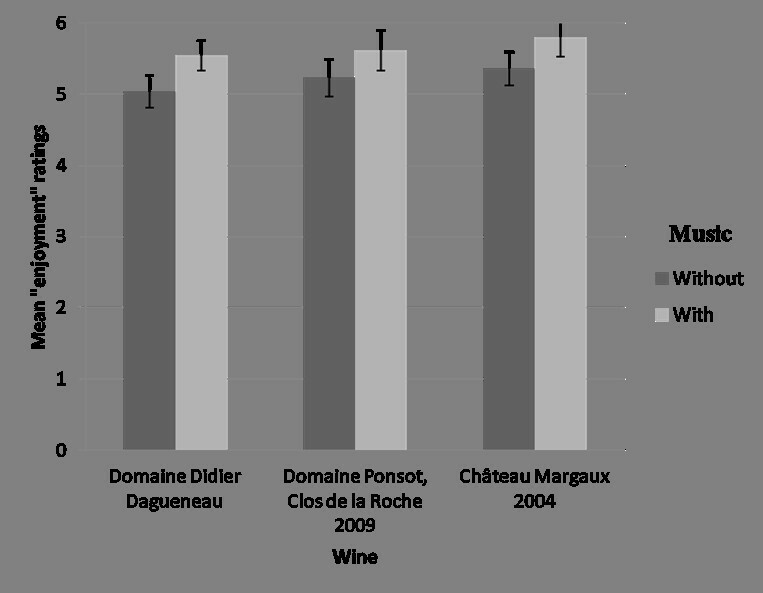 Pairwise comparisons revealed that Château Margaux 2004 was rated as higher in alcohol than the Domaine Didier Dagueneau (P = .039). No significant terms were found for the analysis of this attribute. There was a significant main effect of the wine (F(2, 48) = 81.219, P < .001). Perhaps unsurprisingly, the Château Margaux 2004 was rated as more tannic than either of the other two wines, followed by Domaine Ponsot, Clos de la Roche 2009, and finally the Domaine Didier Dagueneau (P < .001 for all comparisons). Crucially, the analysis of the data from experiment 2 revealed a highly-significant main effect of music (F(1, 24) = 8.167, P < .001), with the participants rating the wines as being more enjoyable while listening to the music (M = 5.65) than without (M = 5.19) (P < .001). See Figure 2 for the mean ratings when tasting in the absence of music and while listening to the music. 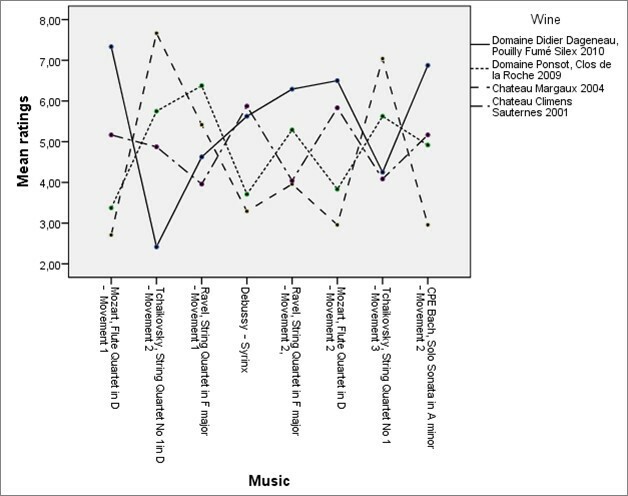 The key result for present purposes is the significant main effect of matching music on our participants’ overall enjoyment of the wine (P < .001, see Figure 7). Note that one limitation with the present study was that the music was pre-recorded and played over a fairly low quality hi-fi system. One might reasonably anticipate therefore that the beneficial effects of playing the matching music on participants’ enjoyment of wine would be even more pronounced were the matching music be played live, as anticipated for the third and final tasting. Mean ratings of how enjoyable the wines were when rated without music versus when rated a second time while listening to the pre-recorded musical selections in experiment 2. The results of the two experiments reported in the present study demonstrate that people do indeed reliably associate certain kinds of classical music with particular wines. These results therefore add new evidence concerning how music can influence participant’s perception of wine. For example, Tchaikovsky’s String Quartet No 1 in D major turned out to be a particularly good match for the Château Margaux 2004 (red wine), while presenting a particularly bad match for the Domaine Didier Dagueneau, Pouilly Fumé Silex 2010 (white wine). Meanwhile, Mozart’s Flute Quartet in D major, K285 was found to be a particularly good match for the Pouilly Fumé but a bad match for the Château Margaux. On the basis of these results, it appears that wines displaying prominent acidity offer a good match for musical pieces that incorporate the flute, while red wines appear to offer a crossmodal match for string quartets. That we obtained any significant results in experiment 1 is all the more impressive once it is realized that we selected a much narrower range of wines and musical styles/excerpts than have contributed to previous research in this area. Note here that all four wines were from the same region (France), and that the music selections only involved wind and string instruments (that is, brass and piano were absent from all of the musical selections, despite their being often chosen as the instruments that best match particular taste/flavor attributes; ). The results of experiment 2 demonstrated the significant effect that listening to music that has been pre-selected (in experiment 1) to match the wine can have on how enjoyable people find it to taste wine. Participants rated each of four wines twice: for the first three wines, the second rating took place while the participants listened to the most appropriate musical selection, based on the results of our first experiment. We specifically investigated whether presenting the appropriate music would actually enhance participants’ ratings (that is, enjoyment) of the wines when the two were experienced together. The results provided clear evidence in support of such a claim. Mean enjoyment ratings were significantly higher (approximately 4.6%) when listening to the matching music (M = 5.65) than when rating the wines in silence (M = 5.19). Having demonstrated in experiment 1 that social drinkers experience particular pieces of classical music as corresponding with specific fine French wines, one question for future research will be to determine whether sensory characteristics or semantic or emotional associations govern this matching. Our results provide some modest support for Gray’s  suggestion of an emotional mediation with which we started this piece: ‘ Red wines need either minor key or they need music that has negative emotion. They don’ t like happy music… Cabernets like angry music’. In particular, the music with the highest scores for the Cabernet Sauvignon (Chateaux Margaux 2004) were the Andante cantabile (Movement 2) and Scherzo (Movement 3) of Tchaikovsky’s String Quartet No 1 in D major (musical Selections 2 and 7, respectively). While the Andante is slow in tempo with a melancholic melody, the Scherzo is more vigorous and, at times, has a discordant sound to it which could be described as heated and possibly even angry with its energetic bow strokes. The hypothesis of an emotional mediation account is different from the explanation that one might simply match the stimuli presented in the different modalities based on how much one likes them individually (see ). Such an account has also been tested in the domain of color and music matching (see [35, 36]). Here, though, it would seem that the complexity of the matched object might involve other matching principles, noticeably of the kind of sensory correspondences between flavor/aromas and sounds evidenced elsewhere (for example, ; see  for a review). It would seem possible that people might match stimuli crossmodally in terms of their intensity, or brightness, both putatively amodal stimulus properties (; though see also ). However, it is important to note that these are but a few of the various accounts for crossmodal matching (or correspondences) that have been put forward over the years (see [9, 38, 40, 41], for others). Further research is clearly needed in order to determine the most appropriate explanation for these findings. Relevant to answering this particular question, researchers will need to investigate whether the consensual crossmodal matches documented here in Western participants would also be deemed appropriate by those who come from a very different cultural background, and who are thus perhaps more familiar with a very different musical repertoire [21–48]. One potential concern regarding the results of experiment 2 is that our participants might simply have given a higher numerical rating the second time that they evaluated the wines, regardless of whether or not any music happened to have been playing in the background. Now, while this certainly does not seem to have been the case for the sensory-discriminative attributes of the wine (see Table 1), it seemed possible that hedonic ratings (for example, of enjoyment) might be different (see also ) - especially given evidence concerning the mere exposure effect (for example, [49, 50]). However, the results of the comparison between the first and second ratings of the fourth wine (the dessert wine), did not show any such significant effect (M = 5.48 on first tasting versus 5.60 on second tasting - thus only a very slight trend was observed in that direction).j Hence, it can be concluded that it was the presence of the music that made a difference to the ratings obtained during the second tasting of the first three wines. One other possibility that we cannot evaluate with the present dataset concerns how much of the beneficial effect of the music depends on its crossmodally corresponding to the wine. Thus, we know from previous research that simply listening to music or noise can impact on taste sensitivity and the higher level semantic judgments that people make about a wine’s qualities (see [23–34, 36–41, 43–51]). It would therefore be interesting in future research, to compare people’s rating of a wine when the putatively matching music is played versus when mismatching music is played instead. So, for example, the results of experiment 1 clearly demonstrate that people thought that for Tchaikovsky’s String Quartet No 1 in D major, offered a very bad match for the Domaine Didier Dagueneau, Pouilly Fumé Silex 2010 (white wine). One more abstract concern about the most appropriate interpretation, or rather extension, of the present results, for example, to more commercial contexts relates to the question of whether people need to be primed to think about the relationship between the music they are listening to and the wine that they are tasting in order to make the connection between one and the other. Certainly, the results of North’s  study suggest that this need not be the case. A second concern, more generally, is about the role of any experimenter expectancy effects in this kind of experimental design (involving, as it does, a public tasting event). Here, one might wonder what role the experimenter’s hopes, or for that matter the participants’ own opinions regarding what is being tested and how they might be expected to respond could influence the pattern of results obtained (see for example, [52–57]). While such concerns are by no means specific to the crossmodal matching or/influence of music on wine (see, for example, [58, 59]), the public and interactive environments in which such data are collected presumably leave themselves open to such indirect forms of influence. That said, a number of the participants from experiment 1 came away from the event convinced of the veracity of the phenomenon (suggesting what we were picking up on was more than merely experimenter expectancy effects). Having demonstrated that people enjoy tasting quality wines more while listening to matching music, one further question to be addressed by future research will be to determine whether the crossmodal influences documented here also operate in the opposite direction - that is, can people’s appreciation of classical music also be enhanced by drinking wine? It may perhaps be that the influence is bidirectional, so it would be interesting to see whether the wines may also enhance the appreciation of these pieces of music . In addition, further research is needed in order to clarify the potential mechanisms that explain these matchings. The results presented here provide some of the first evidence for the idea that people follow similar crossmodal correspondences when pairing wines and classical music. In addition, the results reveal that classical music can enhance the overall experience of drinking wine. All together, these findings suggest that music-wine pairings may not only reflect wine writers’ idiosyncratic matches [1–3], but more general crossmodal associations that are shared by social drinkers, which also provide the social drinker with useful information about the expected sensory properties of a wine. These results may be explained in terms of the potential crossmodal correspondences that exist between the various features of music and wines [8–38, 42, 43, 60]; nonetheless, research is still needed in order to clarify the potential mechanisms that explain these matches. aNote also that wine is not the only foodstuff that people have started to match with music: a number of chefs have recently started to suggest musical pairings for their recipes too (for example, see [61, 62]). Or take the following from A A Gill (, p. 174): ‘If heaven is eating foie gras to the sound of trumpets, then purgatory is a hamburger consumed to the sound of the same shrill, flat note being blown on a harmonica over and over’ (see also [64, 65]). bPaul White , p. 122 captures the concern here when he says that: ‘…I’ ve rarely resorted to describing wines through musical terminology (staccato, crescendo, rubato, riff, and so on) or made direct associations between tunes and individual wines: ‘This Riesling is so middle- period Nirvana…’ That’s not to say those aren’t valid expressions; it’s just not the way I’ve sensed wine and tried to lay it out in words. To be frank, I’ve always feared how easily that sort of discussion can end up sounding trite or pretentious or simply slink off into esoteric nonsense’. cFinally, beyond the occasional use of classical music metaphors when describing fine wines, these two classes of stimuli have also been shown to have something of an affinity for one another in previous marketing research. So, for example, Areni and Kim  have demonstrated that customers in a North American wine cellar spend significantly more on a bottle of wine classical music happens to be playing in store than when ‘Top-40’ pop music was played instead. Such a pattern of results have been taken to suggest that both expensive wine and classical music may share a semantic association with the notion of high quality or classiness. dCharters and Pettigrew , p. 126 also note that: ‘[…] informants considered that the consumption of wine shows some similarities to the appreciation of ‘pure’ art forms - especially music […]’. eThe orthonasal olfactory system is associated with the inhalation of external odors as when we sniff a wine in the glass, while the retronasal system (involving the posterior nares), is associated with the detection of the olfactory stimuli that emanate when odors are periodically forced out of the nasal cavity when, for example, we swallow a mouthful of wine. fWhile some writers have been tempted to explain such surprising crossmodal matches in terms of synesthesia (for example, [14, 60]), this is not an explanation that we find particularly useful (see ). That said, we are rather partial to the name ‘oenesthesia’, coined by Jo Burzynska (MW), and used to describe the widespread tendency for people to match sounds, instruments, and music to the tastes, aromas, and flavors that are present in wine. gIt should be noted here there is a very recent precedent for studying crossmodal correspondences involving pieces of classical music in the work of Palmer, Schloss, Xu, and Prado-León . These researchers documented some surprisingly robust crossmodal correspondences between pieces of classical music and color patches in both Californian and Mexican participants. hWhat we are looking for here is captured by the following from James John, Director of the Bath Wine School when he says of the combination of Mozart’s Laudate dominum, and Chardonnay: ‘[…] Just as the sonant complexity is doubled, the gustatory effects of ripe fruit on toasted vanilla explode on the palate and the appreciation of both is taken to an entirely new level’ (quote from ). Of course, there are alternative views of the interaction of wine and music as captured by the following from Doug Frost (MW): ‘So I don’t want music and wine to match up; I want them to talk to each other. They may agree; they may argue. Sometimes they don’t speak at all; they just yell past each other. That’s cool too’ (quote also taken from ). iEmile Peynaud (, p. 104) was perhaps prescient in this regard then when he advised the professional wine taster some years back that: ‘The sense of hearing can interfere with the other senses during tasting and quiet has always been considered necessary for a taster’s concentration. Without insisting on absolute silence, difficult to obtain within a group in any case, one should avoid too high a level of background noise as well as occasional noises which can divert the taster’s attention’. jFurthermore, any slight trend toward the fourth wine being rated more highly the second time round might in part be explained by a few of the participants subsequently admitting that they had not rated this wine, when instructed to do so in silence, but had instead waited until the putatively matching music had been played. We would like to thank The Antique Wine Company for providing the testing facilities and wine used in the present study. We would also like to thank The London Symphony Orchestra for providing the musical excerpts utilized in the present study. This project was not funded by a funding agency. CS, LR, EK, AMH, VD, and AS developed the idea of the research project and coordinated the logistics, together with The Antique Wine Company (who selected and provided the wine), and The London Symphony Orchestra (who chose the musical selections). CS, LR, EK, AMH, VD, and AS collected the data. CS, CV, LR EK and AMH conducted the analysis of the data. CS, OD, and CV interpreted the data, and drafted the manuscript. All authors read and approved the final manuscript.